88 Commercial Real Estate & Properties in Geebung are listed in 4 categories. We have 69 Industrial Warehouses Sale & Lease , 17 OfficesSale & Lease , 3 Retail ShopsSale & Lease and 1 Other Commercial PropertiesSale & Lease . Ray White Commercial Northern Corridor Group is pleased to offer for Lease this 1,022m2 cost effective warehouse featuring: High ceiling warehouse with roller shutter entry Excellent natural lighting saving on electricity costs Area for container set down and large vehicle access Lessor will consider all reasonable offers To arrange an inspection or for further information contact Juma Marstella of the Northern Corridor Group. 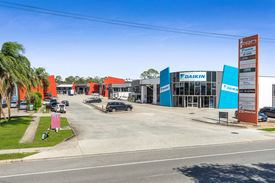 The property is located within the Geebungs industrial precinct, approximately 13kms North of Brisbane's CBD and withing close proximity of the Motorway, Airport and Port of Brisbane. Features: Dado construction High bay clearspan warehousing (8.8m 10.7m ) On grade access via 3 container height roller doors Fully operational security camera system (Internal and External) Existing racking available via negotiation (approx 1,065 pallet spaces) Two recessed loading docks with levellers ESFR sprinkler system throughout Large awning for all weather loading Large three phase power supply Ample hardstand for truck access Portable site office with a/c or fit out options available On site parking Prosperity Place, Geebung is found in the heart of Brisbane's northern business district and offers a range of industrial and retail uses. Geebung has an approximate commuting distance to key infrastructure: Geebung Train Station 450m Robinson Road 700m Sandgate Road 2.1km Gympie Road 3.8km Gateway Motorway 6.8km Brisbane CBD 11km To book an inspection, or request additional information, please contact the exclusive marketing agents from Ray White Commercial (Qld). approximately. Ray White Commercial Northern Corridor Group is please to offer A/106 Robinson Road Geebung for Lease. 416m2 of modern first floor office Ducted air conditioned, internal amenities Board Room and open planned office Located beside National Businesses Customer Parking and undercover staff parks Signage opportunity to busy road Onsite Cafe and walking distance to transport Opportunity 500 metres from Sandgate Road, 12 Kilometres from the CBD and 5 minutes to Gateway Motorway. For more information or to arrange an inspection please contact Juma Marstella on 0450 360 321 or email jum.marstella@raywhite.com. Modern Industrial Unit offered For Lease in Brisbane's Northside suburb of Geebung. Mezzanine Area: 143m2 Ground Floor Office Area: 100m2 Warehouse Area: 900m2 Total Area: 1,143m2 Two (2) container roller doors at front B Double access to site Great exposure to Robinson Road 8m internal height 10 car parks Available Call Richardson Wrench Commercial Brisbane North to book an inspection. Inspection available by appointment only. This 700m2 clear span facility is located 12 kilometres from Brisbane CBD in the northern industrial suburb of Geebung. The facility has recently seen a significant and impressive refurbishment as well as new lighting. Air conditioned reception and office at entry with small first level office. Features include: External walls are brick and metal 4 roller doors including 2 electric 3.2 tonne crane Ample on site car parking Concrete hardstand This tenancy benefits from close proximity to major arterial roads including Gympie Road and the Gateway Motorway. Contact the agent today for your opportunity to secure this facility in the industrial heartland of Brisbane. For more information or to arrange an inspection contact David Bright. 420m2 Freestanding Property Ready for Business Featuring: bull; Ventilated clear span warehouse with good lighting bull; Split partitioned office/showroom bull; Separate amenities with shower bull; High exposure signage bull; Level concrete yard area, fenced and lockable. Call Today Located within Geebung's industrial precinct, close to arterial routes and bus and rail transport. Approximately 13 radial kilometres North of Brisbane's CBD. Transport and only 15 minutes from the CBD. For more information or to arrange an inspection please call Juma Marstella on 0450 360 321. 130sqm of high quality office on Ground Floor High standard fit out Ducted air conditioning throughout 2 Exclusive car parks with good street car parking 650m from Geebung train station For further information or to arrange an inspection contact Richardson Wrench Commercial Brisbane North now. 190sqm of high quality office on level 1 High standard fit out Ducted air conditioning throughout 3 Exclusive car parks with good street car parking 650m from Geebung train station For further information or to arrange an inspection contact Richardson Wrench Commercial Brisbane North now. Good quality fitted out office with warehouse High roller door High ceiling warehouse Available now For further information or to arrange an inspection contact Richardson Wrench Commercial Brisbane North now! 177sqm Highbay warehouse with office and W.C Two exclusive car parks Three phase power Ideal for warehousing/storage/small business Close to major transportation routes and public transport Geebung is situated in the centre of the Northside of Brisbane between Sandgate and Gympie Roads. This location allows excellent access to all northern arterial routes, Gateway Motorway, Airport Port. Geebung also has two train stations and is only 11km north of the CBD. For further information or to arrange an inspection contact Richardson Wrench Commercial Brisbane North now! Highly Functional 550m2 Warehouse and Showroom Featuring: bull; Clearspan warehouse with 8m+ ceilings bull; 5.5meter container high roller shutter bull; Container receiving area bull; Ground floor showroom, natural light and fitout bull; First floor office, open plan and partitioned bull; Amenities on both levels and shower bull; Reserved parking Convenient Geebung location Call Today Located in Geebung's industrial precinct. approximately 5 kilometres from the Gateway Motorway, 12 kilometres from CBD. Close to Airport, Port and arterial roads. For further information please contact Juma Marstella of Ray White Commercial Northern Corridor Group. 245 m2 total building area Comprising 164 m2 warehouse with mezzanine storage + 81 m2 reception/showroom/office Roller door access to warehouse Great exposure Good signage provisions Parking directly in front of tenancy Call The Commercial Guys today to book your inspection or for further information. Unless otherwise stated, the price/property may be subject to GST and/or outgoings. Flexible Warehouse features: bull; Wide awning for street profile bull; Flexible showroom / office area bull; Roller shutter to workshop bull; Mezzanine storage bull; Internal toilets bull; Dedicated parking Call Today Located in Geebung's industrial precinct. approximately 5 kilometres from the Gateway Motorway, 12 kilometres from CBD. Close to Airport, Port and arterial roads. For further information please contact Juma Marstella on 0450 360 321. Rare investment opportunity to acquire a quality investment property housing one of Brisbane's longest operating Seafood businesses: bull; Tenant is Richards Brothers Seafoods an established business with a 30+ years trading history. bull; Current rental $44,064 pa net. bull; Lease commenced 28.08.2017 for three years. bull; Three year option. bull; Suit SMF investor. 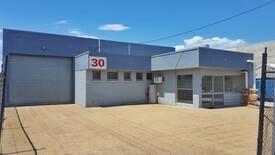 bull; 273m2 Modern warehouse. bull; 90 pallet (approx) freezer room. bull; 30KW solar system. Call Today The property is located in Geebung approximately 5 kilometres from the Gateway Motorway, 12 kilometres from CBD. Close to Airport, Port and arterial roads. For further information please contact the exclusive agent Juma Marstella of Ray White Commercial Northern Corridor Group. 110m2 Workhorse Warehouse $18,500 pa + outgoings + ..
Clean 110M2 Tilt Panel Warehouse Offering: bull; Ground floor storage area with high roller shutter bull; Internal Toilet bull; Timber stair case to tidy office with AC bull; Mezzanine storage area with high roller door for loading bull; Glass shop front Natural lighting bull; Reserved parking Call Today Located in Geebung's industrial precinct. approximately 5 kilometres from the Gateway Motorway, 12 kilometres from CBD. Close to Airport, Port and arterial roads. For further information please contact the exclusive agency listed. Located on Robinson Rd at Geebung; this large clear span warehouse is suitable for storage, no office fit out, easy access for trucks container loading. Warehouse Hardstand Clear span Large complex Container loading Truck access 1,375m2 Available June 2019 For further information please contact us at Richardson Wrench Commercial Brisbane North. Mezzanine: 117m2 Ground: 618m2 Car Parks: 8 Available: February 2019 Located on Robinson Rd at Geebung this modern complex is b double friendly with renovated interior ,2 large roller doors ,potential container set down area. Modern offices. Geebung is approx 11 km from the CBD and is serviced by bus and rail with easy access to the Brisbane Airport and Gateway Arterial. Contact Richardson Wrench Commercial Brisbane North now! 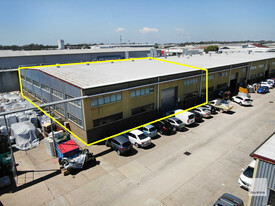 735m2 Excellent Office Warehouse Combo - Heart Of Geebung! $8,268.75 pcm plus Outgoi..
735m2 Corporate tilt panel office warehouse combo B Double access with container set down area Easy access with dual container height roller doors Close by airport and key arterials with good parking onsite This clear span office warehouse combo is located on busy Robinson road and features corporate office space over two levels, good access through dual roller doors, internal warehouse height of 8m and three phase power. Other features include kitchenette, amenities, ample car parking, exposure with pylon signage, and effective truck turning. Be quick to inspect!! For further information or to inspect please contact McArthur & Associates. 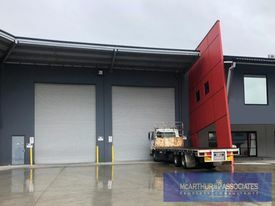 457m Versatile Tilt Slab Warehouse & Office Combo $5,141.25 pcm plus Outgoi..
â¢ 3250m2 high span warehouse 60m x 54m deep â¢ Roller door access for convenient container unloading â¢ Good natural light with 4.5m height clearance, bases re topped â¢ Centrally located to major arterials, Brisbane CBD and airport Ideal storage space or large scale manufacturing site that is competitively priced. Offering good height clearance for easy container loading and unloading, the site is centrally located for easy access to major arterials, Brisbane CBD and Airport. For information or to arrange inspection contact McArthur and Associates.